Michael Hettich has published over a dozen books and chapbooks of poetry, most recently Systems of Vanishing (2014, winner of the 2013 Tampa Review Poetry Prize), The Animals Beyond Us (New Rivers Press, 2011), and Like Happiness (Anhinga Press, 2010). His poems have appeared in such journals as Poetry East, Ploughshares, Orion, Alaska Quarterly Review, and Prairie Schooner, and he has collaborated widely with musicians and visual artists, most notably on The Sweat Broadsheet Project and The Heartlands Broadsheet Portfolio and with Extra Virgin Press. He lives in Miami and teaches at Miami Dade College. His website is michaelhettich.com. The frustration and helplessness in this poem feel so true to life: how much work the speaker must exert to make sense of what is happening around him/her, and how unsuccessful those efforts often are. It’s those pesky crows—how they insert themselves—at first to make the tree seem upset and then to obscure the speaker’s attempt to reach the person in the house. And yet, the speaker’s own cry is “like a crow”; it obscures rather than connects. How often do our own thoughts or the attitudes of our community have the same effect? How often do we discover, after reflection, that our perceptions of the world have more to do with ourselves than with the people we meet? 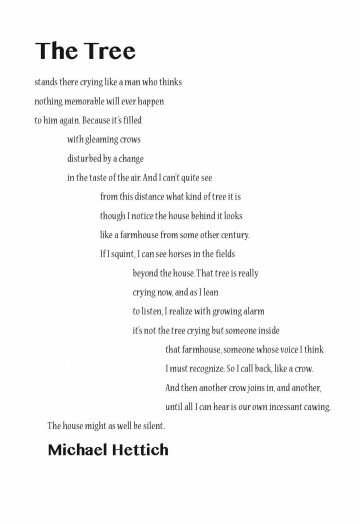 The step-like arrangement of the poem reflects the speaker’s incremental perception of the scene: the tree, the crows, then the farmhouse and horses, and finally the true source of the crying: “someone whose voice I think/ I must recognize.” The last line snaps back to the left margin just as the speaker realizes that his response has obscured the call of the person he wishes to reach; the poets name just below it suggests the identity of the person in the house. Nueva Std is lightweight, but its contrast between thick and thin strokes gives it significant movement, not unlike shrubby underbrush. Sinhala MN is much heavier and emphasizes the vertical with thick, tree-like strokes. The poet’s name stands just below the silenced farmhouse like a stand of trees harboring crows.